Hubby and I decided that we would do a weekend getaway in Louisville and go to the Kentucky state fair before it closed. Since he had a business meeting that weekend and would already be staying at the hotel, we could just purchase a additional night. 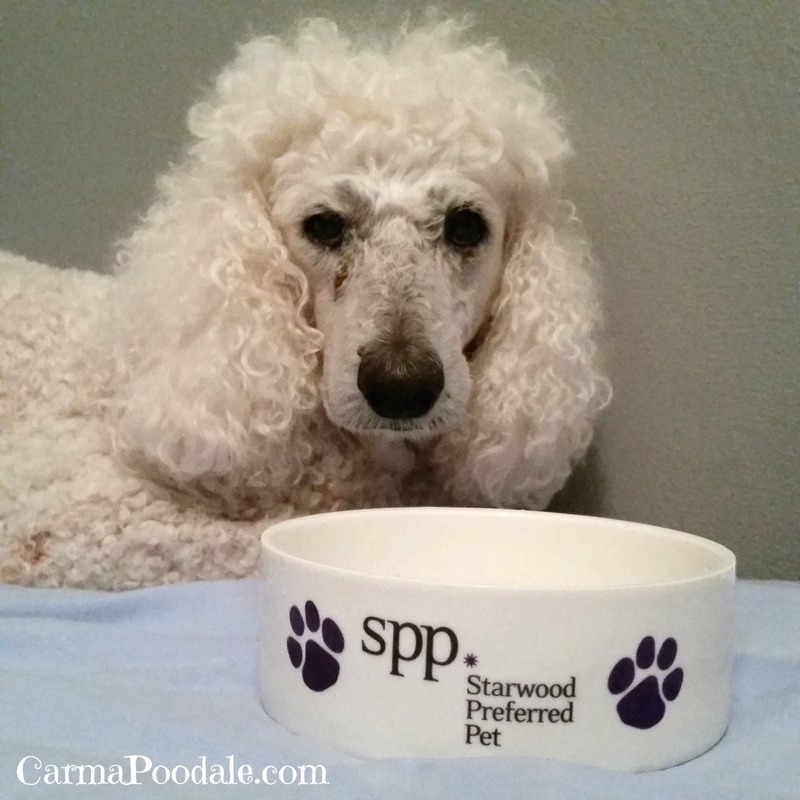 When he got confirmation that he would be staying at a Starwood hotel, I checked out which one it was. We had never stayed at this one before and it looked very nice. Carma was sent a gift and I was so surprised and appreciative of it, I wanted to tell you all about great customer service. I have not even thanked them personally yet. These are my own words and I was not asked to talk about this brand. I checked my SPG (Starwood Preferred Guest Rewards) points and seen I was only a few short. I purchased the additional points that we needed and booked our stay. I couldn't wait to get to go to the fair. I had to take her to the vet. He said because it was too close to her eye that it would best to burn it off. While she was under we took off a few more that was bothering her. On Thursday she was acting as though she felt worse than the day before. I couldn't get her to eat or drink. On a whim, I contacted @SPGAssist on Twitter and asked them about what would happen if I had to cancel our reservation. I explained to them what was happening with Carma ( a medical alert service dog) and told them I sure hoped she felt better the next day. Since the @SPGAssist people do not sign their name I can not brag about whom I spoke to but the answered my questions and told me they sure hoped my pup got better soon. On Friday I told hubby that I couldn't go with him. Carma had started running a fever and if she felt as bad as she looked, she had to be in major pain. Hubby left to do a few service calls and would stop back by before heading to Louisville. I couldn't get Carma to stand up. This scared me. I picked her up and she yelped. I put her in the car and to the vet we went. She was dehydrated so she had to have intravenous fluids. Doc gave her a shot of antibiotics, a pain shot, and she started the fluids. At this point I knew I wasn't going to be able to go. I sent a text to hubby telling him what was going on and after I got done with our conversation, I got on the SPG APP. I canceled the reservation. 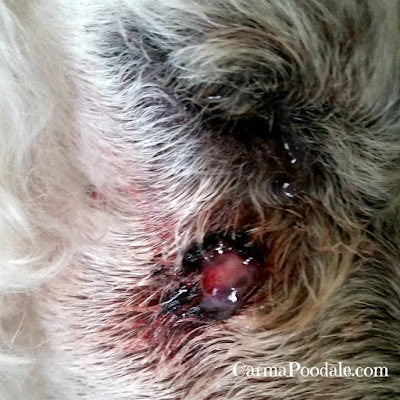 Carma has been healing and she has had no more infections. Today the FedEx truck pulled and brought a package. At first I thought it was something my kid ordered but when I seen my name I was surprised. When I seen the name on the package it made me smile. 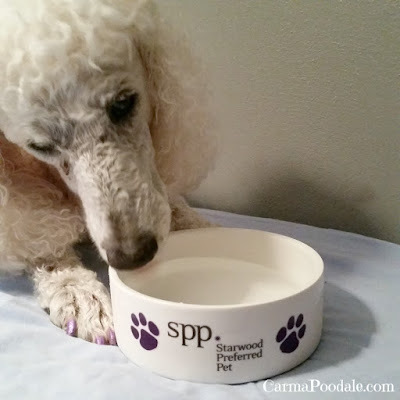 The Starwood hotel representatives sent Carma a ceramic bowl and the sweetest note along with it. I think like this is so thoughtful. 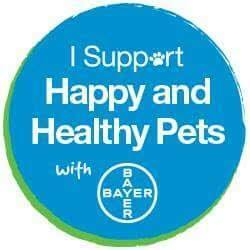 It is wonderful knowing there are still companies out there whom care about their customers whether they are fur babies or humans. Starwood Hotels will always be on the top of my lists of lodging. I have always enjoyed staying in their hotels. With customer service just a tweet away and their easiness to talk to, it gets high marks in my book. Not to mention they have the most comfiest beds I have ever slept in. Any time we go to a conference, we always stay at a Starwood brand hotel. I have never had a complaint about the rooms. 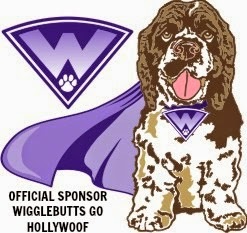 Soon as my girl gets back on her feet and ready to travel, we will be staying at the Starwood hotel. Hubby said that the hotel was the nicest he stayed in this year. Thank you Starwood hotels for keeping customer service alive and well. You sure lifted our spirits togay with your thoughtful gift to Carma. It was a huge surprise to get the gift. I have always appreciated how quickly the respond to questions when tweeted. Goes to show that some companies really do care about their customers.